Daily Thoughts and Random Ideas: Blessed Walpurgis Night! Well, finally I'm posting ON a Pagan Sabbath. Well, is Walpurgis Night a Sabbath, or should only Beltane be considered the Sabbath. Be it as it may, hey! It's Walpurgis Night! I would have loved to be home and "celebrate" it all by my own - as my pagan celebrations usually go like - with, you know, some pagan music, a little makeshift altar to celebrate, a glass of wine (I'm out of Blue Moon and Samuel Addams, so no beer, and I can't find any kriek in here), and maybe a slice of bread for cake or something of the sort. Some meditating, so goofing all by myself and so on. I wonder if my Pagan friends are celebrating this night on some fun way, like bonfires, lots of booze, some naked or half-naked dancing and goofing. I'd totally be into celebrating with a bonfire on the beach, at night, with the low rumble of the waves humming all around us. Then again the weather isn't very gracious these days in here, with the rainy season coming in and bringing afternoon showers and hail sometimes. Oh, you know what would be awesome? Celebrating taking a loooong bath surrounded by candles! Or maybe I just want to soak in a little, surrounded by scented candles and either listening to music and reading some, or watching TV while sipping some wine. Walpurgis, well, Beltane, is all about fertility, happiness, enjoying and celebrating life and "prosperity", not in the sense of richness - or at least I don't interpret it that way - but the abundance of what we do, what we make, what our work produces. These couple of weeks and days have been hard and busy, full of work both at the office and with the University, with hardly a moment to do anything else. In a way, I'm kinda thankful my brand new tablet broke, so I don't have to be bothered by e-mails and messages when I had to deal with more pressing matters. 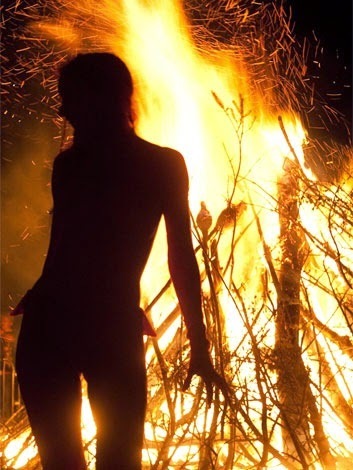 Yeah, I've been neglecting social media and friends quite hardly, but then, that's the heat of our work, and that's the fire of Walpurgis, the celebration of Beltane. Wouldn't you agree? Better busy than bored!